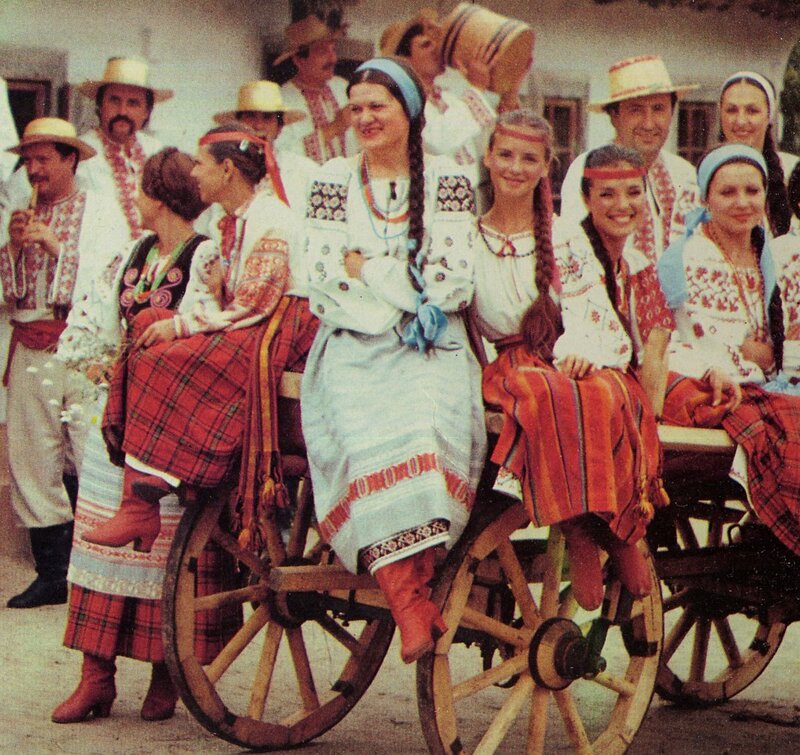 Today I want to finish an analysis of the costume of West Polissia, Specifically the northern parts of Volyn' and Rivne Oblasts in Northwest Ukraine and neighboring parts of Bielorus, which also has a large Ukrainian population. 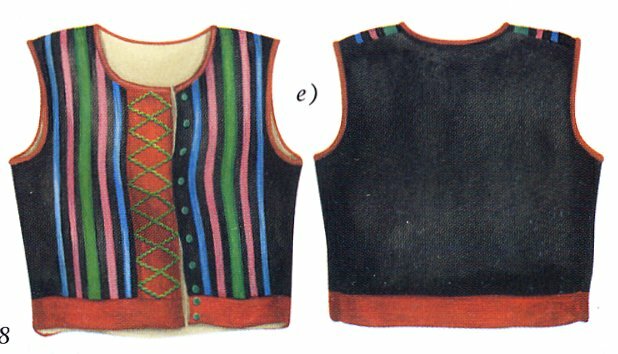 In my previous posting, I talked about the prevalence of woven linen in the costume, and the ornament woven in or embroidered with zavolikannia. 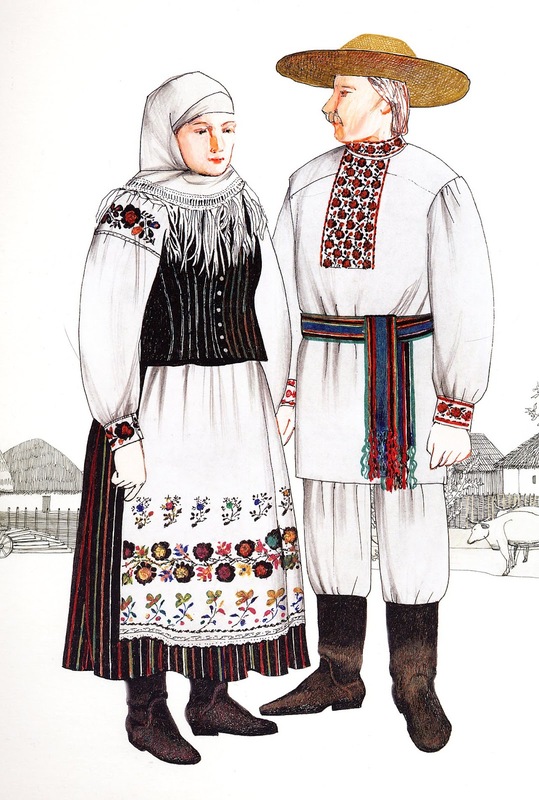 Here above is a drawing of a wedding couple from this region, The man is wearing a boutonniere, and the woman a special cap made of artificial flowers, colored feathers and ribbons. The rest of the costume is typical of holidays. 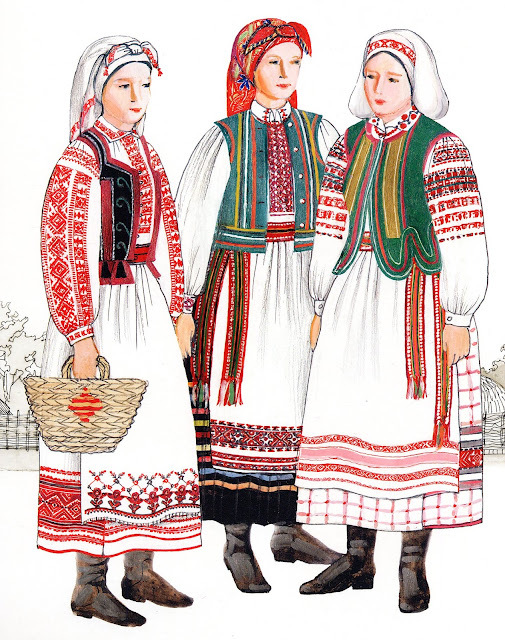 The linen skirt with woven white, unbleached and red designs is replaced on holidays and cooler weather by a wool skirt called litnyk. This is typically red with narrow vertical stripes of other colors woven in, often with a contrasting band on the hem. 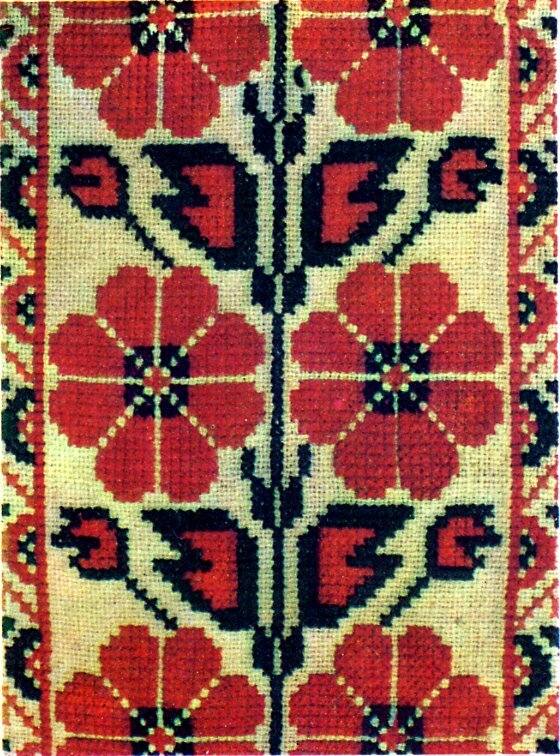 The apron may be linen with embroidered ornament, as in the first image, or it may be wool, with horizontal stripes on the lower part, as in this image. There is a woven sash with fringe on the ends, again mostly red in color. 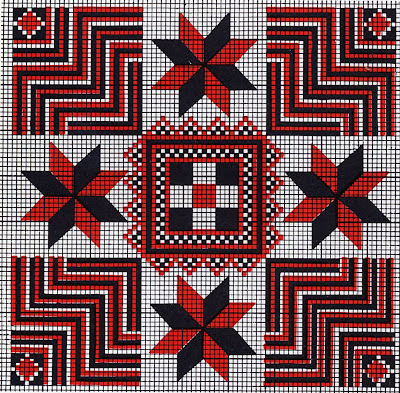 The litnyk was also sometimes plaid, again usually with red being the predominant color. For woman of a certain age, it was considered more appropriate to wear a darker color. 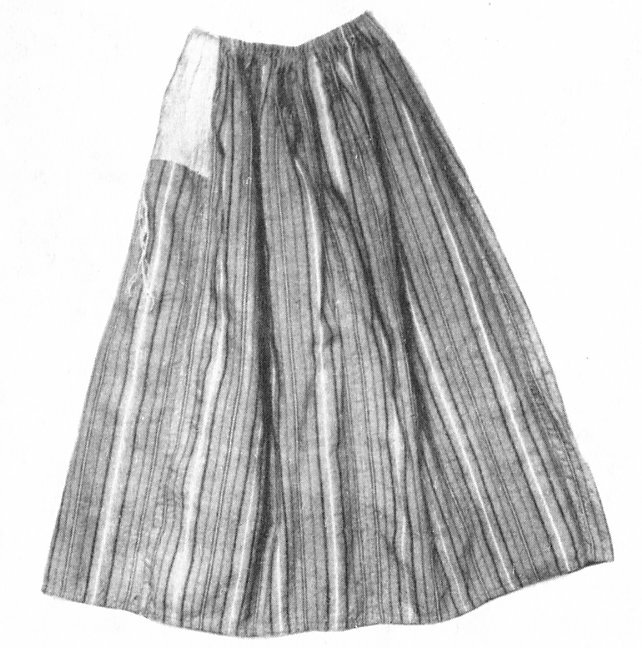 Later the skirt was sometimes made of bought cloth, in which case, there were ribbons sewn onto it near the hem. This type of skirt was sometimes pleated. Notice the woman in the center of this image. This type of skirt is also worn in central Polissia. 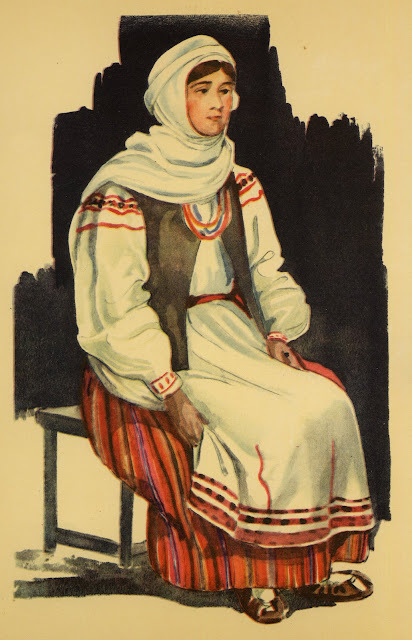 This exact costume is also found just over the border in Bielorussian Polissia [Palesie], most commonly somewhat further east. These women are from Homel' province. You can also see some examples of the types of vest or bodice worn in this region. Often, of course, none is worn. One type is that which extends to the waist and stops. This type is also found in central Polissia. 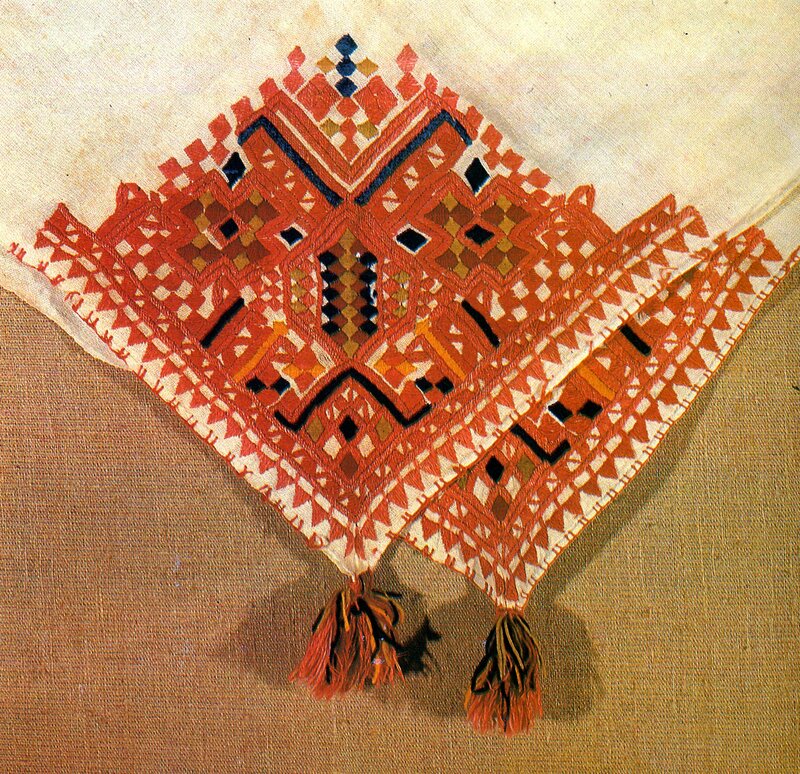 It is commonly made of bought cloth and is decorated with ribbons. It is made basically with straight sides. A variant of this type of vest is somewhat longer, still cut with straight sides, but coming down to the hip. Here is a photo of a woman from the village of Horodets', in Volodymets' county, now Rivne Oblast. 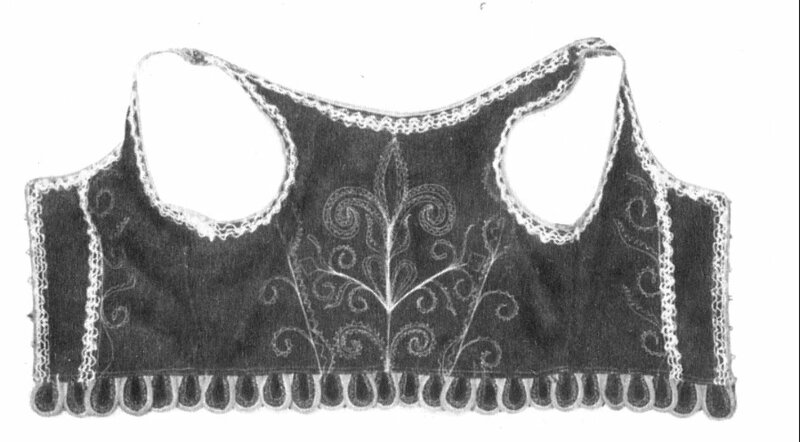 In the western part of this region, bodices with lappets were also worn, similar to those found in Poland. These are often called 'shnuriwky', although they did not always lace up in front. 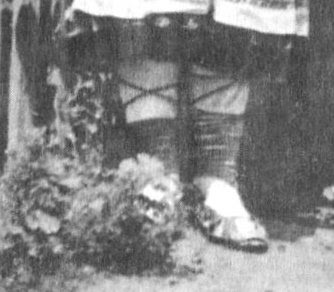 The original footwear of the region, when not going barefoot, cosisted of footcloths 'onuchi', and lychaky, that is, footwear woven of birch or linden bark. These were locally referred to as 'postoly', which name is usually applied to moccasin type footwear. Of course, anyone who could afford it wore boots, and later, shoes, as you can see from the various images in this article. 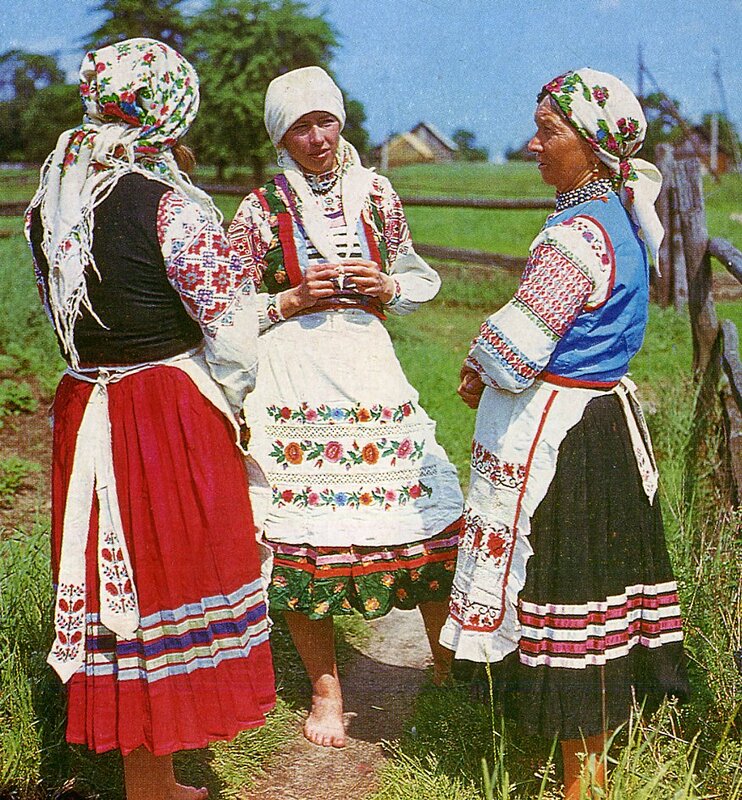 The original headwear in this region, as in most of the territory from Lithuania to Romania is the long narrow linen scarf known as the namitka or peremitka. Already by the beginning of the 20th cent. this was becoming rare, and only preserved in some places. 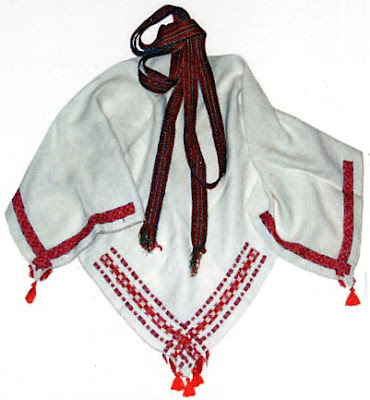 In many areas of Volynian Polissia, it was replaced by a white kerchief with embroidered corners. These often had tassels on the corners. The embroidery was usually counted satin stitch, cross-stitch, or a combination of the two. Amber, coral and glass bead necklaces were worn by those who could afford them. Also medallion necklaces, 'dukaty' were worn here as they were in other parts of Ukraine, although not as often, as Polissia is a relatively poor region. 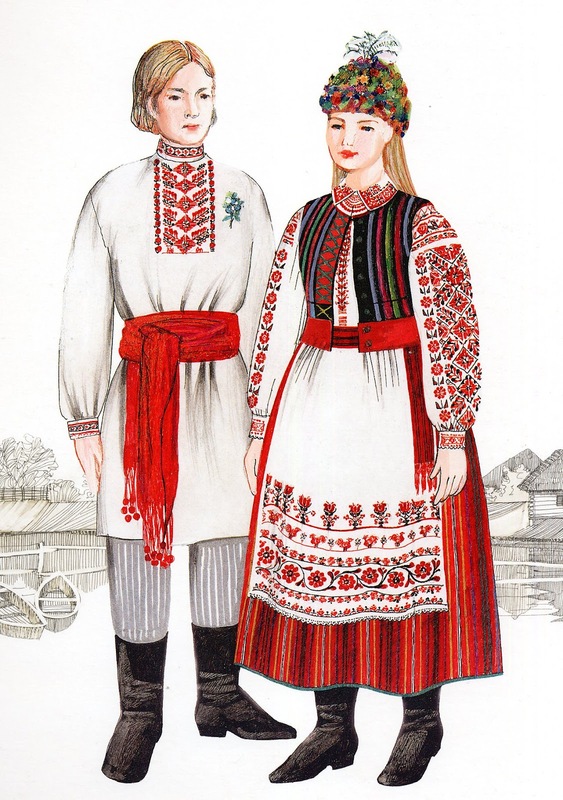 The men's costume, as you can see from the above images, consisted of linen or wool pants, white, or gray, possibly with stripes, a sash, woven or braided, sometimes with pompoms on the end, and also a shirt. The shirt was worn over the pants and had the collar, cuffs, and front placket embroidered. 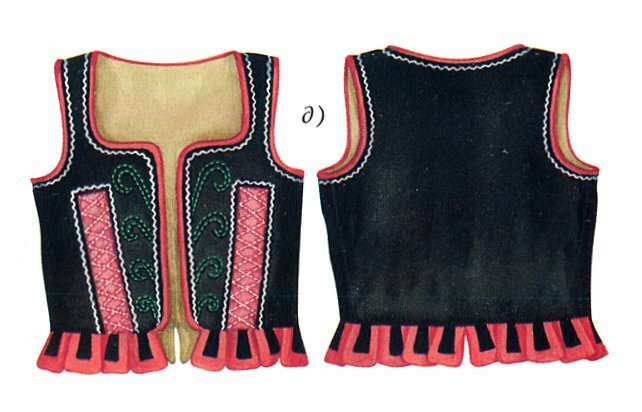 The embroidery sometimes consisted of two bands on either side of a front opening, like this example from my personal collection. This shirt is embroidered in zavolikannia. The embroidery was also often done on a seperate rectangular placket which was then sewn onto the front of the shirt. In this case, the opening was at the left edge of the placket. 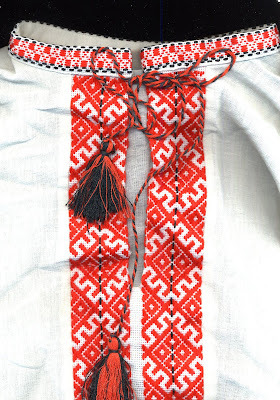 In contrast to the Russian kosovorotka, however, in Ukrainian shirts the embroidery is always centered. 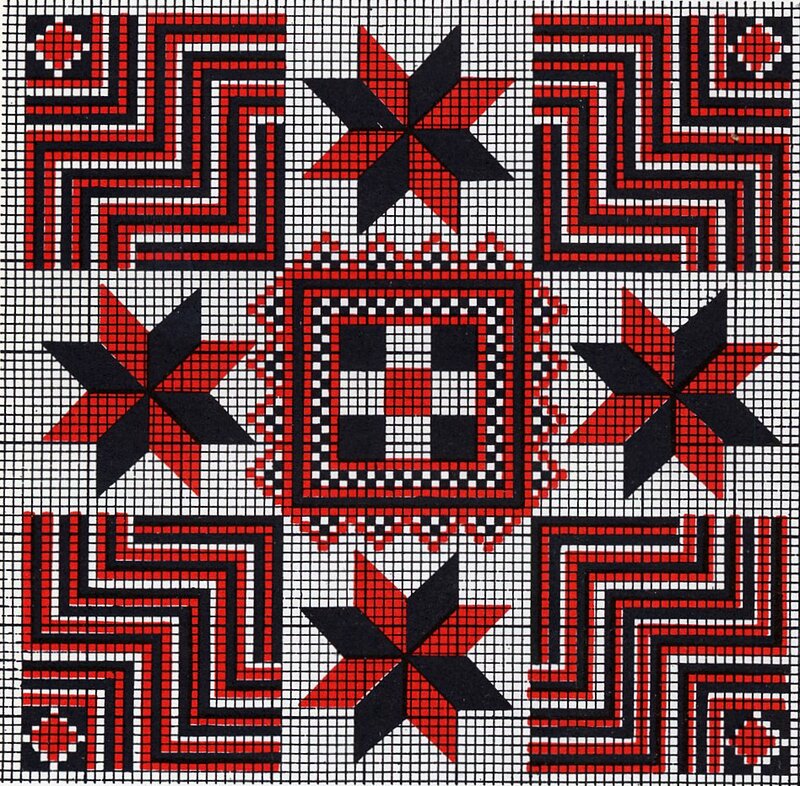 The older designs were done in red and black, like this one. 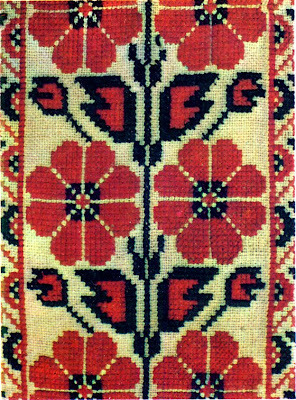 Most commonly they were stylized floral motifs, simpler and more geometrized than other regions, with less fine detail and stronger design elements. Later, other colors were added, as in this example, which is also from my private collection. 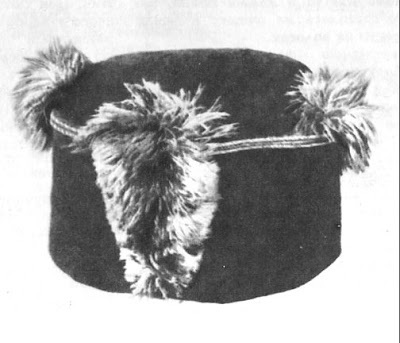 Straw hats with wide brims were worn in summer, and wool or sheepskin hats in winter, like this example. Thank you for reading, I hope that this has been interesting and informative. It should inspire us to look at these products of a region which is physically poor in resources and yet so rich in home-made beauty. Here is an interview with two Ukrainian men from Polissia who have put together a wonderful collection of Costumes and costume pieces from this region. They are obviously native to this area and speak Ukrainian beautifully. The interviewer sounds like she learned Ukrainian from a book, and her pronounciation leans heavily towards Russian. Many beautiful pieces in the collection. 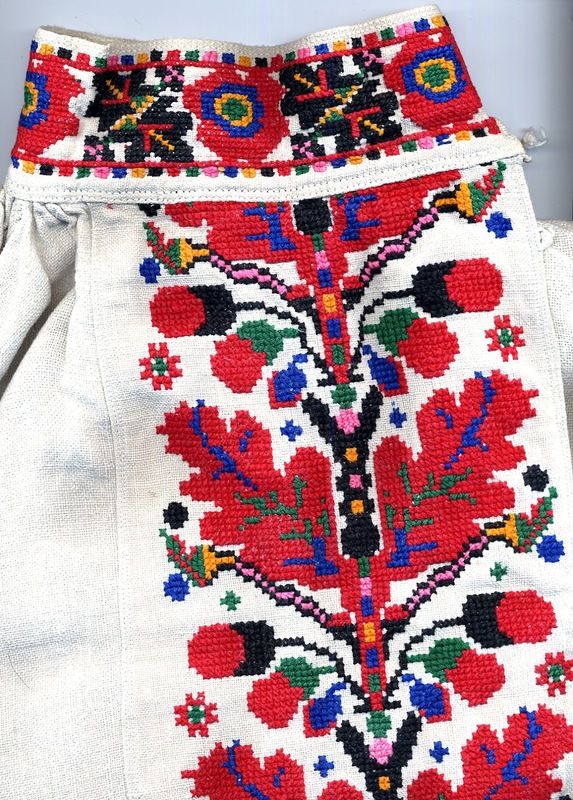 Here is an article about the exhibit of this same collection in the Ivan Honchar Museum, one of the best such museums in Ukraine. Thank you for this blog. It's absolutely wonderful! 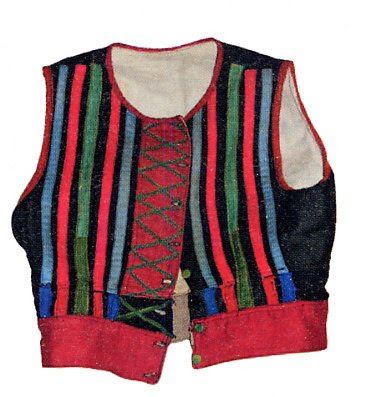 I'm trying to make a vest similar to the sort seen in Serbia and there abouts and happily stumbled on your blog. Great post, fantastic colourful pictures. Hi My heritage on my mom's side is from this area, thank you for your wonderful research =). I would love to hear from anyone that would like to write to me. This is great, I've been researching my mom's side of the family (who are from Wołyn - back when it was Poland) and stumbled across this.